Many options are available when selecting what type of commercial office glass wall system that will best fit your needs. Each design option will vary in the amount of total allowable visibility through the glass panels that one sees from any adjacent part of the common area. Commercial window walls in Austin can create an invasion of privacy within an office if a proposed design is not totally taylored and understood. A newly highlighed room's function and privacy can be maintained simply by varying the amount of glass area used, it's degree of transparency, and the locations of the glass panels within the office walls. The end use of the new office and its inhabitants must be taken into account before adding any type of glass wall system. 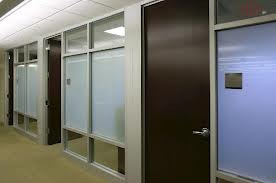 Glass wall systems can be as simple as the use of a sidelight next to the office entry door to verify if a meeting is in progress to utilizing a full height glass wall offering total visibility and openess to the office. Modesty concerns can be accomplished by incorporating half glass wall designs or by the use of transom windows located above doors into the design but still maintains the open feeling. Translucent applications such as etching or films applied directly to the inset glass can retain the security of total privacy however still providing a feeling of open confinement due to the presence of natural light. Clear glass panels can be totally divided using wood or metal framing components or each of the glass panels can be chemically attached for a free flowing look. Glass blocks can also be used as a means to provide privacy given their translucent characteristic and they can be installed in interesting patterns. Just be sure your design fits the need because glass walls are much more expensive than their drywall counterparts. Work areas hold the most importance since they are tied directly to the income of any business. Private offices will be assigned as needed. Larger open spaces for setting up cubicles or multiple work stations can take up the majority of your new floor space. Storage areas for office supplies and even shipping areas will take up space as needed by the occupant according to the type of business they are in. 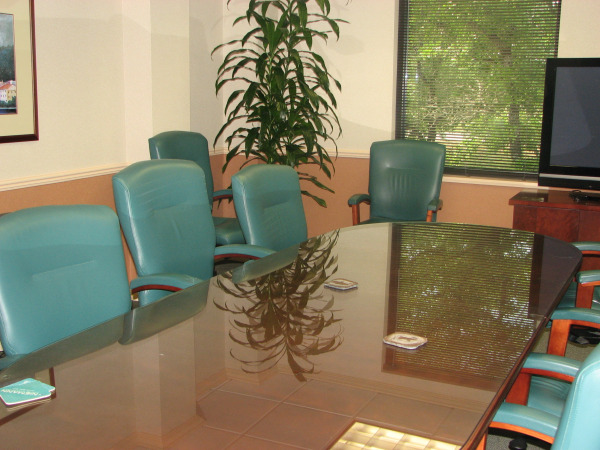 Conference rooms can be placed either off to the side or within the very center of your space. Ceiling,floor, and wall treatments can be upgraded here because they will help define this room as being special. Installing commercial window walls or even half glass walls can highlight any conference room within your space and still provide privacy for business meetings. Window treatments like blinds or drapes can be added to increase the room's privacy when needed. Be sure to prewire for any devices used during presentations and don't forget about controlling the room lighting. Reception areas make the first impression on the people coming into your office for the first time. Careful consideration must be given to their presentation. Are there enough seats for the amount of people who will drop by at any one time? Are there accessible writing surfaces for anyone who enters even if they are in a wheelchair? Does the room provide comfort to those who are waiting for an appointment? Remember this room could set the tone for a very important future meeting involving your business. Breakrooms need to be sized according to the number of people using the facility at any one time. All care should be taken for providing ADA accessible routes throughout any of the shared usage areas. ADA compliant kitchen cabinets should be used within the break area that provide sink space at the proper height above the finished floor and the proper clearances with protection below the sink area. If you were fortunate enough to have private restroom facilities installed be sure they fall within ADA compliance. 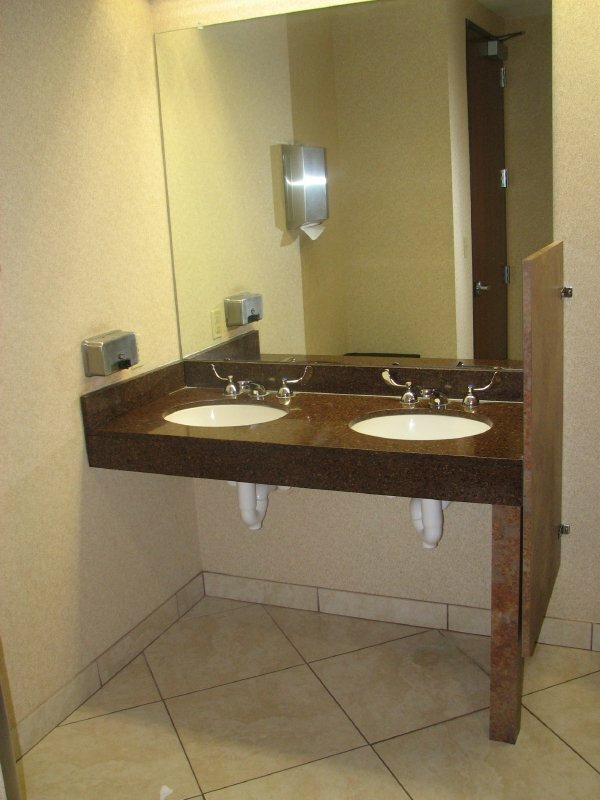 Special vanity and fixture requirements for height, clearance, and reach must be observed throughout the restroom. You never know when you might hire a person with special needs. Typical commercial tenant improvements Austin involve a different type of construction techniques that you won't find in your home's construction. The beauty of metal stud walls below a grid ceiling is the ease of altering a given situation or floorplan. It is easier to add or remove these walls than it is the ones within your home because of the way wooden framing is tied together. Electrical devices can be easily added or a lay in light fixture placed within the grid for additional lighting. That is why the systems were created since not every office configuration will work for every tenant. The door and window systems are normally formed using aluminum extrusion materials clip together so that they can change locations without being destroyed. They look clean and are architecturally pleasing to the eye. Tenant finishes can vary from merely a paint job to demolishing the entire space and starting over to better utilize the square footage. Utilization requires planning in advance and knowing all your business's operational needs. Work areas will always be defined per function. Storage areas, breakrooms, conference rooms, and reception areas should be considered so that the entire office flows well during hours of operation. Shipping can definitely be a consideration even if it doesn't play a major part in your business. Maybe your space is large enough to include the addition of private restroom facilities in addition to those located within the common area? Many options are available when selecting what type of commercial office glass wall system best fits your needs. Each situation will vary in the amount of total allowable visibility as seen from any adjacent part of the common area. Commercial window walls can create an invasion of privacy within an office if a proposed design is not totally taylored and understood. A newly highlighed room's function and privacy can be maintained simply by varying the amount of glass used, it's degree of transparency, and the locations of the glass panels within the office walls. The end use of the new office must be taken into account before adding any type of glass wall system. 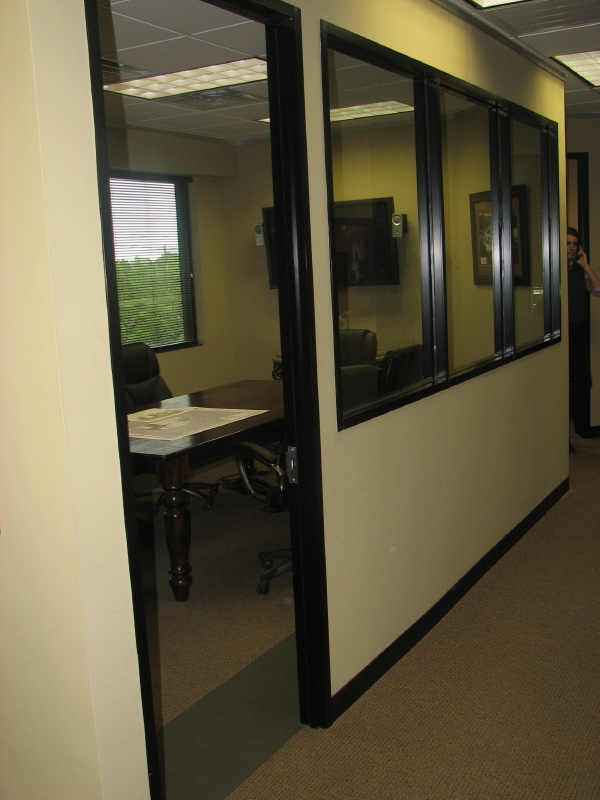 Glass wall systems can be as simple as the use of a sidelight next to the office entry door used to verify if a meeting is in progress or utilizing a full height glass wall offering total visibility. Modesty concerns can be accomplished by incorporating half glass walls that still maintain the open feeling. Translucent applications such as etching or films applied directly to the glass can retain the security of total privacy however still providing a feeling of open confinement. Work areas hold the most importance since they are tied directly to the income of the business. Private offices will be assigned as needed. Larger open spaces for setting up cubicles or multiple work stations can take up the majority of your new floor space. Storage areas for office supplies and even shipping areas will take up space as needed by the tenant according to the type of business. Be sure you get the experienced help you need and always hire a local tenant improvement contractor to help you make the decisions that will need to be made in order to create a successful project. Office remodeling in Austin, Texas and Tenant finishes can vary from merely a paint job to demolishing the entire space and starting over to better utilize the square footage. Utilization requires planning in advance and knowing all your business's operational needs. Work areas will always be defined by their function. Storage areas, breakrooms, conference rooms, and reception areas should be considered so that the entire office flows well during hours of operation. Shipping can definitely be a consideration even if it doesn't play a major part in your business. Maybe your space is large enough to include the addition of a private restroom facility in addition to those located within the common area? Utility and energy management systems are evolving into a major factor of any new office building design. As energy prices continue to escalate and consumers become more self conscious about how they are using that energy, more and more conservation techniques will become common practice. Lighting and conditioning unused or seldom used areas of a large office will become a thing of the past. It will no longer be cost effective to operate any office environment in the way we once did when energy was cheap. Isolating and zoning off rooms filled with freight or containing only a few employees for limited amounts of time will become the norm. As building professionals, tenant improvement contractors need to help their clients identify these energy wasting situations and incorporate limited lighting and atmospheric conditioning into the design within these areas. Energy minded construction techniques will become second nature for our future and should be practiced by all commercial construction contractors.